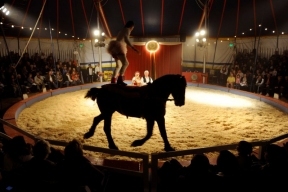 Zoppé, an Italian family circus, returns to Addison Mother’s Day Weekend, May 7 through 11. Join the Zoppé family as they journey to an enchanted world, separate from our modern, accelerated electronic age and celebrate life, circus and family. In the “commedia dell’arte” tradition, the one-ring circus features Giovanni Zoppé as Nino, an old-word, European-style clown, along with captivating international acts under the big top at Caputo’s Fresh Market. Acts from around the world join the Zoppé family in a thrilling Mother’s Day performance. No one is farther than 20 feet from the ring. Adults and children of all ages go back in time and experience the excitement and authenticity of a traditional, family circus with a few modern touches. All performances will be held at 510 West Lake Street (Caputo’s in Addison, IL ). Tickets start at $10. Admission is free for kids 13 and under. For more information go to www.zoppe.net/addison or call the box office at (773) 255-1467.